Conrad Schumacher Clinic – It was in the works months ago. When I told Conrad I wanted to head East for the winter, we made plans to continue our work together. He is here for 6 weeks and I took advantage of having his eye. When he said he would travel to Anne’s for a clinic, we easily filled every spot with a wait list. Mainly Grand Prix horses participated, but all so very different one to the next. It was such fun to see the changes in the horses while Conrad performed his magic, asking for honesty in the horse and forcing riders to allow the horse be more on their own. Thank goodness I had done my homework and Anne’s help prior to the clinic magnified the training that had been accomplished since our last rides in Oregon. Being from so far away, it is always difficult to say goodbye. The Derby was held at the beautiful open fields of The Equestrian Estates. Nearly the entire barn was planning on participating in the show, but unfortunately for us there was a outbreak of EHV-1 in Ocala. Being the responsible group of professionals, we chose to opt out and not travel with our horses to compete. Instead we went to the show, played, and had some fun shopping and while Anne was teaching a judges forum, I scribed for her. Great learning opportunity. Meanwhile I had flown in one of my working students, Ashton Vosburg, to groom for me at the show and see what it is like to experience showing at this level. Something she would never see in the entire Northwest because we don’t have shows of this magnitude. It was fun introducing her to many of my trainer friends and riders, owners, judges, and former Olympic riders. Her wide eyes spoke volumes! It was just two weeks later that I finally was able to go to a show. We packed up the girls and I headed south with a long time student of Anne’s. Lisa Giltner owns a gorgeous facility nearby and is one of the nicest, considerate people you will meet. 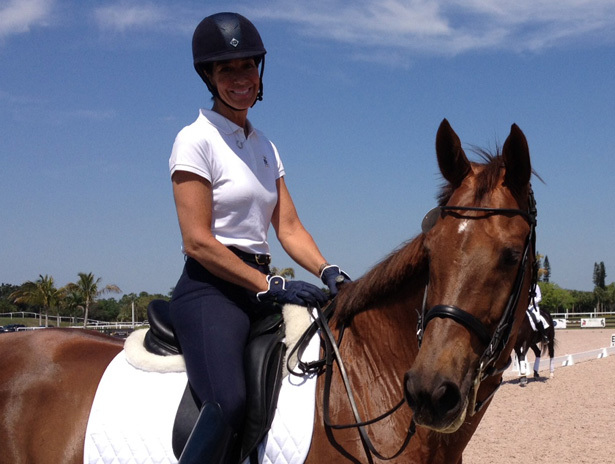 We made it down to the Global Dressage Festival where Anne was also a judge. The day before the show started, we had the opportunity to work with Anne schooling our horses. It was by far one of the best riding experiences I have had. Her calm voice guiding and positive reinforcements talking thru the headset. Not standing and shouting obnoxiously at the side of the ring. The time was productive and, as Anne said, my two mares never took a wrong step. It was because we had a plan, worked on the plan at home, then executed it at the show. It could not have gone better. Bugs – Hmmmmmm. I was just in the process of saying how happy I was that the stories of Florida bugs are false. Until I was reaching to turn off my lamp to go to sleep and there it was. The multi-legged, black furry something tactfully waiting on the wall above my bed. Needless to say I slipped on my big girls pants, found the fly swatter, and quickly sent this creature to heaven. Too bad though. I considered sleep, but knowing “it” had a friend out there somewhere and was most definitely nearby lurking in the dark waiting for me to turn that lamp off, I dosed in and out of sleep in a brightly lit room. The next morning I opened the front door to two new friends. Enormous palm beetles. 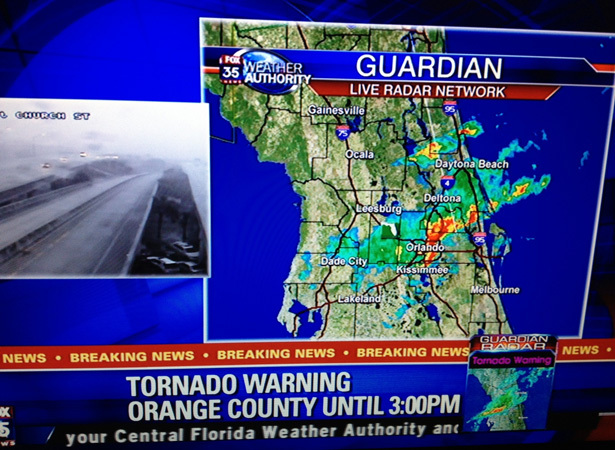 Bugs and tornados – still getting used to life in the tropics. 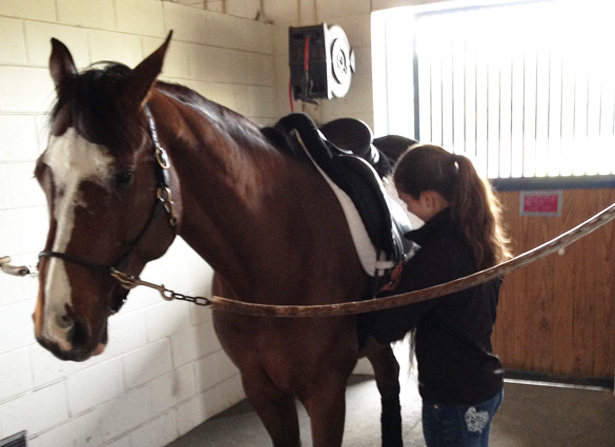 Under saddle – Well nothing has changed with the training and amount of work and pressure we deal with each day. The ante is still up and, each and every day, every stride I ride is an opportunity to learn and teach my horse something needed to elevate their education. I feel it’s my responsibility to be a focused athlete and get the job done so we do not waste any time. People ask… Why this journey? I am not only doing this to benefit my personal riding, but I intend on passing what I have learned on to students. This sport is not about tricks, analogies, or force. It’s about learning how to properly sit and ride a horse harmoniously and produce something that is beautiful to feel and for others to observe. When you receive such valuable instruction, it would be a waste to ignore riders who are in search of knowledge and good help. For me, teaching will be part of my payback to Anne and the generosity of her time. And, like most trainers, we all need to budget because this is a costly sport. I have to earn my money to pay for these excursions like everyone else. Florida show circuit is a chunk of change and it takes a truck full of money! In Oregon, you pay entry fees nearly 1/3 of what we pay here. Lodging is expensive because it is high season for tourists, gasoline is more per gallon. But it’s the incidentals that add up. I won’t go into details, but triple everything and add on several expenses that we don’t have in our area and you will get near the big picture. You are buying the experience for both you and your horse that can not be duplicated in the NW. PS – Thank you Toklat Originals for the beautiful show saddle pads. They are the best I have ever used!